Rapidshare is little tougher then the other download sites but we here to help. Click on the free button that I circle. Oh god I know more waiting and even worst then megaupload. Instead of waiting for seconds like megaupload, now there mins and its 5-4 mins for wait. 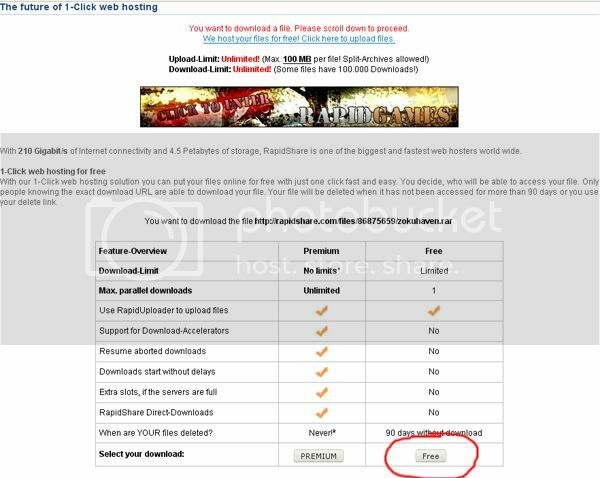 Now follow the same steps like megaupload. The top circle with the big 4 letters in it, type it in the little box that has the arrow pointing at it. Once you're done typing it, press the long download button next to it that I circle. Then a pop up box will appear and "save as" the file on your desktop or anywhere in your pc.